ON FEBRUARY 8, when Abhimanyu, Arjun, Gajendra and Harsha arrived at Amberi village in Maharashtra’s Sindhudurg district, they were greeted with joy by the residents. 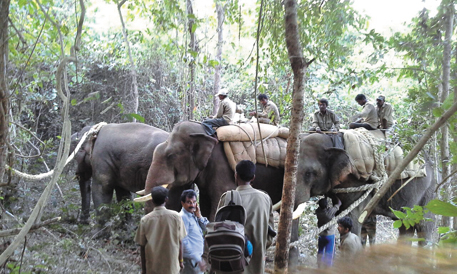 Deputed by the Karnataka government, the fourtrained elephants were on a mission: to capture the wild ones destroying crops and giving the region’s farmers sleepless nights. The Centre had granted special permission for this first-of-its-kind inter-state operation. The four elephants were accompanied by 204 officials of the Maharashtra and Karnataka forest departments, including 25 elephant caretakers, called kavadi in Kannada, mahouts and two veterinarians. All the team members were covered under life insurance policies. Twelve years ago, no one had the faintest idea that the Maharashtra government would have to undertake such an elaborate exercise and sanction a budget of Rs 69 lakh to tackle elephants. The forests of Sindhudurg are part of the elephant corridor joining the Western Ghats of Karnataka with Kolhapur. Although the elephants sometimes stray out of the forest and enter surrounding villages, no major conflict was reported till 2003. That year, elephants from Karnataka entered a private forest near Mangaon valley and destroyed adjoining fields of paddy, coconut, banana and jackfruit. Such incidents increased in the following years as fragmentation of the corridor reportedly increased. In 2005, wild elephants killed a resident of Shirange village near Mangaon valley. But the government refused to compensate his family, saying that there were no wild elephants in the district. Now, the government has learnt its lesson the hard way. Eight people have been killed in wild elephant attacks while 15 have been injured in the past decade. Some, like Vijaya Jadhav of Ghavanale village, have been left paralysed. Between 2006 and 2015, the government has spent Rs 10.5 crore on compensations for crop losses and deaths in elephant attacks. Anupama Bandelkar of Mangaon village describes the terror that the elephants wreaked in the area. 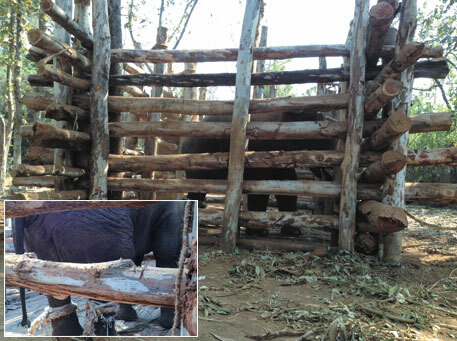 Wild elephants have destroyed her house four times. “We used to remain awake till late at night to message forest guards about elephant movements,” says Bandelkar. The guards would then reach the spot and light up fire crackers to scare them away. But this only offered a temporary respite as elephants never left the region, Bandelkar adds. In November last year, residents of Vetal-Bambarde staged rastaroko to bring the issue on the political agenda. Ramesh Kumar, deputy conservator of forests, Kolhapur, told Down To Earth that after continuous crop losses and threat to human life, the government decided to capture the three wild elephants that were known to have become residents of the region. Arjun, Abhimanyu, Gajendra and Harsha arrived at Naneli village following a tip off by the residents about the movement of the trouble-making tuskers in a nearby forest. At 10 am on February 10, the four elephants led the capture team into the forest. But it was not easy tracking down the wild elephants in the vast dense forest, not even for the jumbo sniffers. Without advanced instruments like walkie-talkies for communication, the forest officials relied on the assistance of local people who were familiar with the terrain. A lot of time was spent trying to locate the wild elephants. Two of them were finally spotted at 5 pm. While one fled upon seeing the approaching team, the other charged at a trained elephant. A veterinarian promptly darted a tranquiliser at it, after which it raced in a different direction. At this point, the trained elephants’ role becomes crucial, recalls Kumar. After being tranquilised, an elephant runs amok for a few minutes and it is difficult for humans to follow it. But a trained elephant can match its speed and track down the animal even if it tries to hide. “It is important to find the sedated animal as it can harm other wild animals or human beings,” says Kumar. The elephant team successfully chased the sedated elephant and found it standing under a tree. The next step was to bring it to the kraal, a wooden enclosure kept ready at the Amberi forest division’s office, 3 kilometres away. For this, the capture team tied one end of a rope to the sedated elephant’s legs and body and the other end to the legs of the trained elephant. The trained elephants also helped the officials to tighten the knots. While Arjun led the sedated elephant, Abhimanyu pushed it from behind and Harsha and Gajendra guarded it from both sides. After jostling for six hours, they could put the 40-year-old, four-tonne sedated elephant in the kraal. On February 12, the second elephant was captured in the same forest, and on February 15, the third was caught. Updates of the captures were forwarded to the chief minister’s office in Mumbai all the time. The Amberi forest division’s office has now been flooded with people wanting to see the captured animals. “The elephants will now be trained for use in tourism, which will take two to six months,” says Kumar. While the forest departments might have captured elephants successfully this time, it has not always been the case. In the past, a pregnant female elephant, which had been tranquilised during capture, died. “She died of a tranquiliser overdose,” says a forest ministry source. A male elephant died due to infection during training in captivity. “The post-mortem report was never made available so we do not have authentic information,” the source says. The problem of human-elephant conflict in Sindhudurg is likely to continue. “Population density is low in this district. There are plenty of water bodies and food is easily available. The Karnataka-Sindudurg-Kolhapur triangle is safe for movements of wild elephants,” explains Kumar. A long-term solution to prevent clashes between humans and elephants from occurring would have to be found. The Forest department of Tamil Nadu have achieved a record of capturing six crop-raiding elephants from Tiruvannamalai and Vellore districts in September last year. This was achieved with the help of 'Khumki' elephants, which are trained ones to handle the crop raiding ones. So any State can approach the Tamil Nadu forest to seek their help in capturing the crop-raiding pachyderms. The State boasts of at least half a dozen Khumki elephants that help in capturing the crop-raiding ones.